*The total amount of payable prizes for all categories offering the grand prize (12/12 and 0/12 categories) is limited to $2,000,000 per draw. If this limit is reached, the prize amounts will be determined in proportion to the number of winning selections of the grand prize. 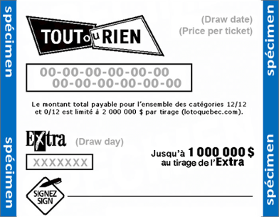 Each draw is conducted as follows: Loto-Québec conducts a draw to determine at random 12 numbers among all numbers from 1 to 24. A selection wins if it matches the winning numbers in its category (see the Prize structure and odds of winning). Only one prize can be claimed per winning selection per draw. *The 5/12 to 7/12 categories are non-winning categories to which no prize is attributed. **The total amount of payable prizes for all categories offering the grand prize (12/12 and 0/12 categories) is limited to $2,000,000 per draw. If this limit is reached, the prize amounts will be determined in proportion to the number of winning selections of the grand prize. You can choose your own numbers by using Loto-Québec’s Lotteries app on your mobile device or online at lotoquebec.com/online. Then, you can choose where you want to pay either at a retailer establishment by generating a bar code online or directly through your Espacejeux account. The bar code will enable a Loto-Québec retailer to register your selection(s) and issue a lottery ticket. As an example, here are the steps to follow in order to choose your numbers through Loto-Québec’s Lotteries app on your mobile device and to generate a bar code. 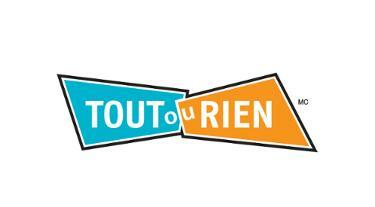 With Loto-Québec’s Lotteries app, select Tout ou rien, and then select Purchase option. Choose your own 12 numbers or select Automatic selection, select OK then Continue. Select the number of draws and select the quantity of Extra numbers you want to play ($1 per number, up to 10 numbers), or select the No box if you do not want to play Extra, then select Continue, and Continue one more time. Choose Buy from a retailer to generate the bar code. Upon presentation of the bar code, the retailer will issue your lottery ticket. You can also choose your numbers on the Internet at lotoquebec.com/online.